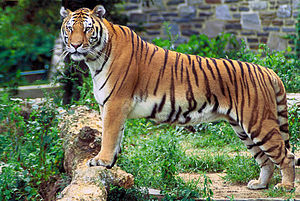 Tiger (Panthera tigris) is sycedēor in þǣre cnēoris Felidae, ān þāra feoƿer "grēatra cattena" in cnōsle Panthera. Gecynde in Asian, is se tiger rēafdēor and mǣst cattiscra cynna in þǣre ƿorulde, mid setnesse gelīc þǣm grīetestum fossil cattum. Man nīwanost wende þisne tramet on þǣre 05:16 tīde þæs 29 Hrēþmōnaþ 2018.